Melandri acknowledged, however, that the initial presentation of Walker’s work was hurtful to members of the community. She promised to modify the work and address the issues raised by the controversial selection. As for Uslip, Melandri said, "I stand behind all my staff." Visitors to the Contemporary Art Museum are now greeted by warning signs and a wall that went up in front of Kelley Walker's Direct Drive exhibit following criticism and outrage of the work. Walker, who is white, has been criticized for appropriating black bodies and culture in his work. 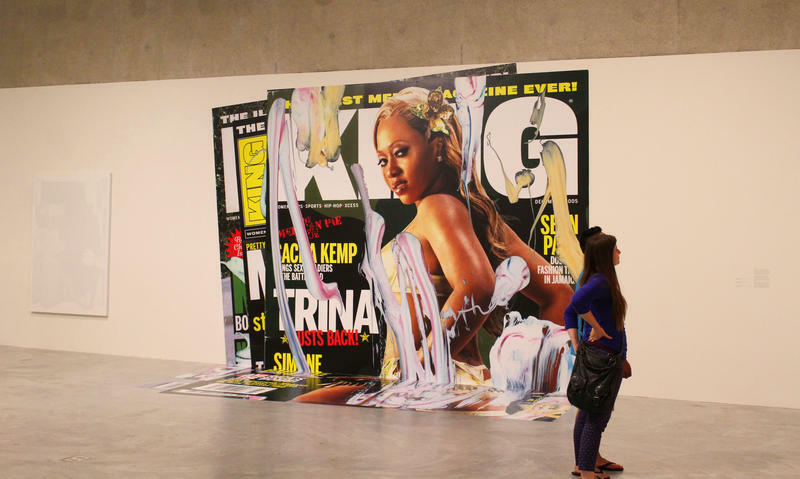 On display are several controversial pieces, including a blowup of a magazine cover featuring a female African-American rapper covered in digital scans of smeared toothpaste. Another display hows a photo of a civil-rights era protester being pursued by dogs splattered with chocolate. The images are displayed as part of a solo show titled Direct Drive. During an artist talk on Sept. 17, local artist Damon Davis criticized the work and challenged Walker to defend his work. Uslip has since released a statement in which he apologized for ending the question-and-answer session with Walker. "I unintentionally ended the conversation too soon, and for this I sincerely apologize," Uslip wrote. "I believe the conversation that started during the artist talk needs to continue, and I am committed to seeing that it does." Walker has said in a statement he released through his New York gallery that he supports social equality and civil rights and seeks to “create thoughtful, sometimes difficult dialogues.” The Paula Cooper Gallery said in its statement that it opposed removing the exhibit and would consider any move to do so censorship. Melandri said the museum will take steps to make the work avoidable for museum visitors. The institution will build a wall to obscure the art in question. It will also display text in the lobby identifying the work as potentially painful. This is an attempt to make the museum available to people critical for the work without removing the work. “We must, however, note that the deep community concern surrounding Kelley Walker: Direct Drive is different and deserves a different response. The show will remain on view in its entirety, but with modifications designed to welcome dialogue and dissent. Additionally, the museum will explore further ways to engage the community in an ongoing and constructive dialogue on the issues the exhibition has raised. Finally, CAM will ensure that the exhibit is properly identified as potentially painful, so that visitors who wish to avoid particularly difficult works may do so." Walker’s work was also the subject of a highly critical panel on Art and the Black Body held at the museum late last week. CAM leadership attended the panel, which included local artists Kevin and Danielle McCoy, Katherine Simone Reynolds, Kahlil Irving, Lyndon Barrois Jr., MK Stallings and Rebecca Wanzo, Ph.D. The updated presentation of the work is still in development. The exhibit runs through Dec. 31.